I sometimes get weather alerts on my smartphone. I sometimes get weather alerts on my smartphone. But until I look at my phone, I don't know whether it's just a “heads up,” or a “head for the hills” warning. And sometimes I don't even see the alert until the next day. The Midland WR120B weather alert radio addresses all those issues. Its color-coded indicators let you immediately know the severity of the alert. And with its 90 dB alarm, you'll know when important alerts come in. The WR120B also can display a flashing warning light, and give a voice alert. The WR120B receives seven NOAA weather channels, which carry flood, tornado, and thunderstorm alerts. You can also program the WR120B to receive SAME (Specific Area Message Encoding) so you get all the EAS and NOAA alerts relevant to your area. You can even program up to 25 counties into the memory. Monitor conditions in a wider area, as well as remote locations — such as counties where other family members live, or where your vacation or weekend home is located. While the WR120B requires AC power to operate, 3 "AAA” batteries (available separately) ensure it will still operate if the power goes out. You can connect an external antenna to the WR120B for stronger reception. There's also a jack for a visual alert light (not included). And for the 99.9% of the time when there's no weather emergency, the WR120B makes a great bedside clock. If features a large, easy-to-read time display, and a programmable alarm with a sleep timer. 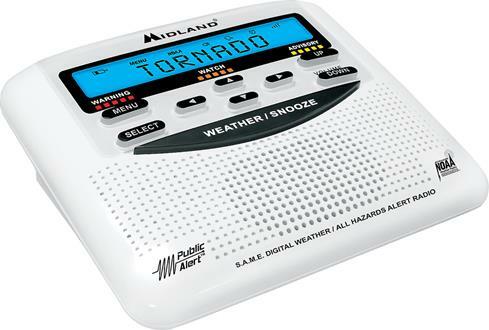 Weather Alert Radio: The Midland WR120 is an All Hazards Alert Weather Radio with S.A.M.E. that alerts you to over 60 kinds of weather hazards and emergencies. When a severe weather watch or warning is issued by the National Weather Service, the WR120 automatically alerts you, giving you the seconds you need to seek shelter. S.A.M.E. : The WR120 also has S.A.M.E. technology (Specific Area Message Encoding). With S.A.M.E. you can screen out unwanted broadcasts and receive only the alerts that are specifically targeted to your area. The WR120 comes preprogrammed to receive weather and hazard alert transmissions for all S.A.M.E. codes within range of the transmitter of the selected channel. Follow the simple instructions in the manual to program the radio to receive alerts just for your surrounding counties or provinces (up to 25). Public Alert Certified: The Midland WR120 is Public Alert Certified - meaning it has been tested and approved to meet the Consumer Electronics Association standards of reliability and quality as a product carrying public safety warnings. Weather-Band Channels: The Midland WR120 All Hazards Alert Weather Radio supports all 7 NOAA / Environment Canada Weather Channels. Selectable Alerts & Languages: You can choose for the Midland WR120 to alert you via its backlit LCD or through its built-in speaker with voice or tones. You can also choose English, French, or Spanish for the radio's language. Display: When the Display alert type is chosen, only a text alert will scroll on the display along with a flashing LED. There will be no audible alarm. 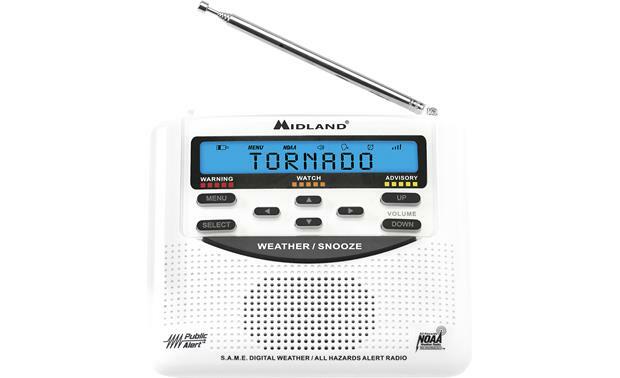 Recent Alerts: The Midland WR120 weather alert radio can store up to 10 different Weather/Hazard alerts for your review later. Backlit LCD: The Midland WR120 weather alert radio features a backlit LCD with black alphanumeric text and blue background. 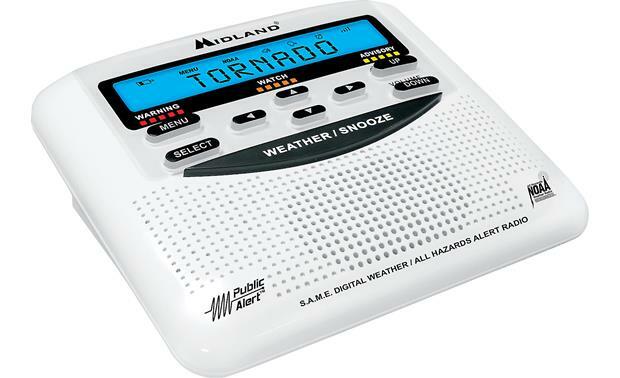 Alarm Clock with Snooze: The Midland WR120 weather alert radio features a built-in alarm clock with snooze. You can program one alarm. The snooze function advances pauses the alarm for 8 minutes. Telescopic Antenna: The Midland WR120 is equipped with a telescopic antenna and feature a mono-RCA external antenna jack. Reception & Placement: Typical broadcasts are within reception distance of 25-40 miles of the weather broadcast station. Location, conditions of weather and terrain effect the reception. If you find reception is not good in your area, try different locations in your home or office to find a spot of improved reception. Placement near a window usually improves reception. Note: The weather alert radio will beep and "Check Reception" will appear in the display if the radio does not receive an alert for 10 days. 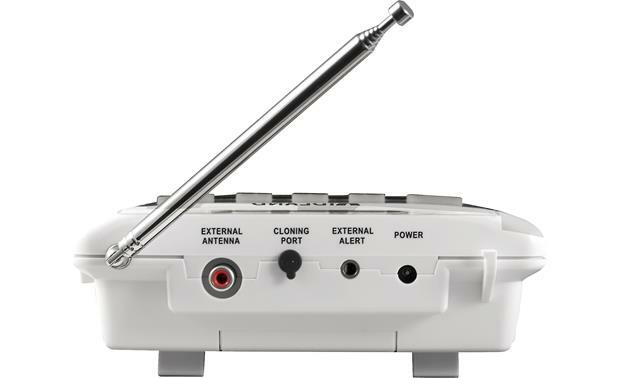 AC Power w/ Battery Backup: The Midland WR120 weather alert radio includes an external AC power adapter that must be plugged into an AC wall outlet or surge protector. The WR120 uses 3 "AA" alkaline batteries (not included) for emergency power back-up. Searches related to the Midland WR120B Weather alert radio with alarm clock.